"Autumn brings its own personality," she said. "Plant colors change in response to shorter days and cooler temperatures." 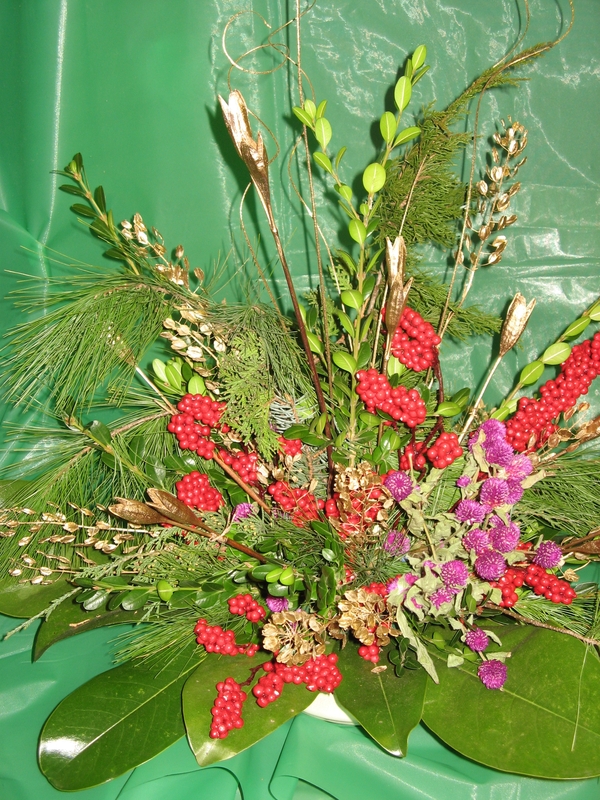 The cornucopia, the symbol of a bountiful harvest providing plenty to eat over the coming winter, is easy to create. Use the traditional horn-shaped basket (available at most craft stores) either as is, or paint or shellac it to give a rich glossy color. Allow plenty of time for it to air dry. Fill it with fruits and vegetables from the back yard, dried flowers, ornamental grass plumes, harvested nuts, and seed pods. Use small water vials, called florist tubes, to add fresh flowers. In December, replace fall items with seasonal greens, berries, and pine cones. "Dry or preserve flowers all season long to use as decorations," Smith advised. "Harvest at the right time for the best color. For most flowers, this will be just after opening and before setting pollen. Some flowers can be collected at different stages of growth." For example, roses can be collected in the bud stage as well as full flower. Hang them upside down from the rafters in a shed or garage. Spraying them with a clear shellac will help prevent them from shattering. Globe amaranth, strawflowers, and sunflowers dry well and can be added to straw or grapevine wreaths in the fall. 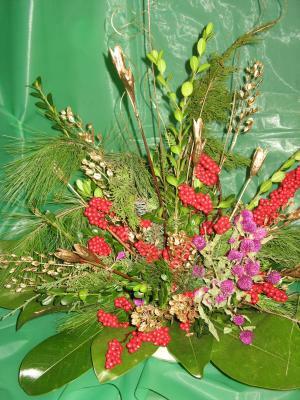 "Vines, evergreen boughs, or dried flowers can be strung into garlands," Smith said. "Dried hydrangea blooms can be secured to a cord using florist wire. Or wire shafts of wheat, trimming stems so all pieces are about the same length. For color, add ribbons, weaving them through as you build your garland." Keep dried materials away from heat sources and open flames so they do not accidentally catch fire. Dried material burns very easily. Also, dried materials saved for many years can get very brittle and shatter. "Don't forget the more traditional fall decorations, such as pumpkins, gourds, and Indian corn," Smith said. "When picking them, wipe them down first with a household disinfectant or a weak bleach solution to kill any surface organisms that might cause rot," she advised. "Then allow them to dry for a few days to several weeks. Once dried, use them as is, or try painting them. For a more natural look, use a paste wax and buff them for a shiny surface."